When you hear the words “day drinking,” what comes to mind? Chances are, you’re taken back to your college days where your friend Jerry was doing a two-story beer bong from the balcony of his frat house. Or perhaps it was that St. Patrick’s Day bar crawl where you and your roommates woke up at 9 a.m. to pregame, and Jessica was puking behind a dumpster by noon. Classy, right? Why does day drinking have to be synonymous with blacking out before the sun goes down? In fact, I’d argue that daytime is one of the best (and one of my favorite) times to drink. And by “drink,” I don’t mean pound bottomless mimosas until I puke up my eggs benedict—I mean sipping on something while the sun shines down on me with some good friends. You know, drinking to enjoy yourself, not solely to get drunk. Day drinking has a bad rep due to the aforementioned college “darties” and boozy brunches. I welcome you to reconsider its merits. Here’s why you should reconsider day drinking, even if you’ve left binge drinking far behind with your embarrassing college antics. You’ve graduated, and so have your drinking habits. You might think that enjoying something boozy before 5 p.m. is a day-ruiner, but it doesn’t have to be if you play your cards right. Besides, there are tons of experiences that can involve alcohol but are more about sipping rather than funneling, if you catch my drift. Why not take advantage of the beautiful weather? Google the nearest vineyard for a chance to do something outdoorsy. Or, pack a picnic with summer sandwiches, fresh fruit, and a mini bottle of rosé for a cheap (and adorable) summer date. While you may think that your brunch selfie looks better with a Bloody Mary in the frame, you only need one for the shot, not an endless parade of drinks. Besides, I’d be lying if I said I never “borrowed” a friend’s drink for a photo accessory then went right back to my green tea. Can’t we all agree that the food at most places that serve “bottomless” drinks is subpar at best and only tastes good after a few drinks anyway? Evening drinking commonly means one of three venues: a bar, a club, or a house party. Occasionally you find a friend with a decent sized back porch, or you brave the line for that cool new rooftop bar, but the end result is the same: downing drinks while standing in a circle with a bunch of people doing the same. Sometimes dancing is involved, and sometimes you have a great conversation with a stranger (or what seems like a great conversation when you’re drunk), but at the end of the day, most nights aren’t distinguishable from one another. With day drinking, the actual drinking component should come second to the activity at hand, whether that’s boating, barbequing, working on your tan, or taking a nice bike ride through the park. Even if the activity your friends are clamoring to do isn’t your usual style, it’s a lot better for your soul than hiding in the AC, disconnected to the people and experiences just outside your door, I promise you. There's nothing worse than downing tequila shots in a dark nightclub with EDM music blasting so loud you can’t even hear what the cute girl next to you is saying. Day drinking can still include tequila (perhaps in the form of a margarita or a top-shelf añejo sipper) for some, but it also means that you can enjoy some fresh air and flowing conversation. After all, it’s way easier to connect with someone when you can actually hear what they’re saying. Being stuck on a boat together doesn’t hurt either. I’ve made “friends” with lots of drunk girls in club bathrooms, but those friendships never flourished past that evening (surprising, I know). With day drinking, I’ve actually made lasting connections or at least followed up on that “OMG we like totally need to hang out!” line that’s so easily rattled off when under the influence. 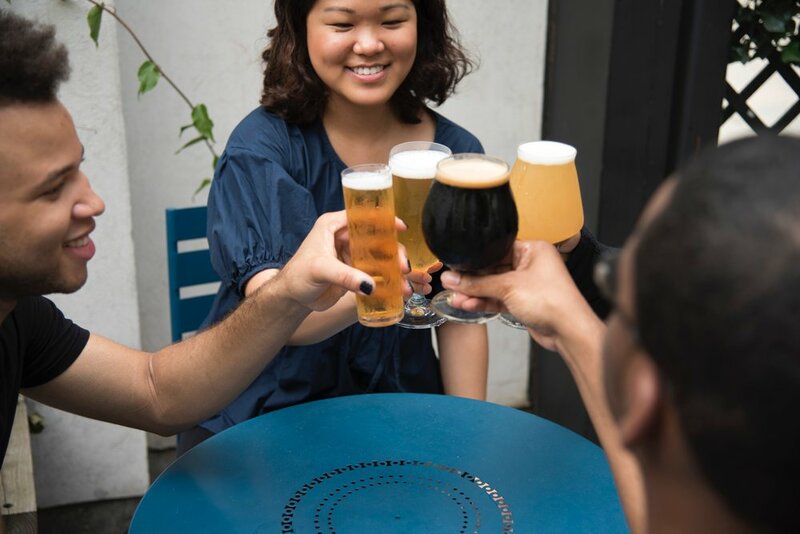 Since it's less expected or acceptable for people to get drunk in the daytime, you won't stand out so much by sticking to your favorite go-to alcohol-free drink. And chances are you won’t be the only one. Hangovers feel worse in the summer, or maybe we just feel more guilty about them because it’s beautiful out, and we’re stuck in bed regretting our decision to take full advantage of Last Call. The good news is if you take it easy on the day drinking, you’ll wake up before noon, actually able to enjoy the next day, too. Sure, there’s a chance you might go to bed a bit earlier than you normally would (alcohol + sunshine = sleepy), but you’ll have enjoyed the day, will head to bed at a reasonable hour, and will wake up the next day feeling well rested and ready to live another memorable day! Ashley Uzer is an artist, writer, and digital consultant. She is currently based in Washington DC, but is frequently traveling. Her happy place is somewhere warm, eating chocolate chip cookies for breakfast, and listening to pop-punk music from 2006. You can follow along with her adventures on Instagram @ashleyuzer or on her website where she blogs about food and fashion, loxandleather.com.